SEAT is planning to produce a Cupra edition of the Leon ST. The high performance estate will be powered by a 2.0 TSI engine with 280PS. Top speed will be 155mph, while the 0-62mph sprint will take less than six seconds. There’s no confirmation on dates or prices yet, but expect to pay around £28,000 when the car goes on sale later in 2014. 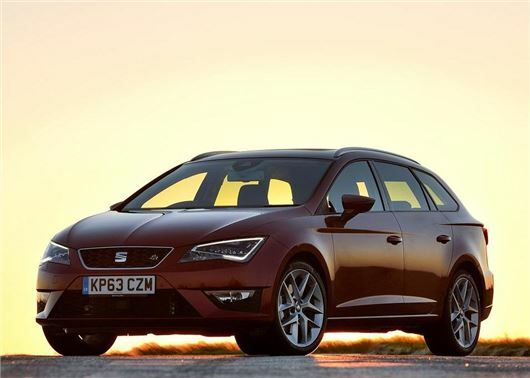 SEAT launched the first estate version of the Leon in 2013 in a bid to broaden its appeal and entice ‘youthful families’ into its cars. The Leon ST is built on Volkswagen’s much vaulted MQB-platform (which was used to build both the Volkswagen Golf and Skoda Octavia estates) and features 587 litres of storage. The addition of a Cupra model will inject some extra spice to the model and present an affordable alternative to the Focus ST estate. The Leon ST Cupra will use the same engine and limited-slip differential as the hatchback edition and have an impressive 350Nm of torque that will peak from just 1750rpm. To make it stand out from the crowd, the Cupra will also get a new 18-inch alloy wheel design, a restyled front end with larger air intakes and full-LED headlights as standard. At the back there's a diffuser with dual oval exhaust pipes. Sports suspension will be included as standard, along with DCC dynamic chassis control system that alters the suspension settings between a sportier or more comfort-oriented set-up. The Leon ST Cupra is still in development, so launch dates are still sketchy, but industry insiders expect the model to reach the UK in the summer of 2014.